Please post any comments regarding Everything-1.3.0.629b here. How weird that I would search voidtools to see if anything had happened here.. not expecting anything but dead nothing. Anyway really good to see the project isn't as dead as I thought and you're still alive, however honestly little disappointed in the actual update. where is the intuitivety in that nonsense. Its nice as an extra for sure, but not to lose existing functionality. Let alone improvements in being able to easily search within all displayed results like for file size matching like between x y file sizes etc as another filter. Anyway whatever, first here to say hi Oh last thing will you be open sourcing this? or selling the tool to a company that might be more actively involved in developing it? Because I think its still more useful than the rubbish MS puts in its OS like win8. But, i have installed on my win 8 64bit and don't see any drive, also on Admin mode. Pratically, i have an empty window. The "old" version works without problems. One of the main reasons for removing filters is because I didn't want to define what an "audio" file was etc. I know its not the same as filters, but you could use bookmark macros. For example, an audio: bookmark macro defined as ext:mp3;wav;flac could be typed in easily after a search. I want to open source Everything, more on this later. But, i have installed on my win 8 64bit and don't see any drive, also on Admin mode. Practically, i have an empty window. Right click the Everything shortcut. In the Shortcut tab, click Advanced. Note: this will bring up the UAC prompt to run "Everything" with elevated privileges. You will need to run Everything as a true administrator for NTFS volume access. Otherwise you need to add the folders you want indexed manually. Select the folder to index. I had to restart the pc for unknown reason, and now, after setting "run as admin" on the .exe directly, works flawless. One of the main reasons for removing filters is because I didn't want to define what an "audio" file was etc." And this is what I mean by improve it, not remove it... I was expecting some options to redefine these filters, or just add more specific ones. "I know its not the same as filters, but you could use bookmark macros. For example, an audio: bookmark macro defined as ext:mp3;wav;flac could be typed in easily after a search." I want toggle windows key back. Good to see the Everything author here again. Looking forward to hear about the future plans. Really great to see some progress on this amazing tool! I'm missing the "-instance" switch from command line. Can you put it back in? I tried out the new 1.3.0.629b. I have not much experience with the earlier versions so I can not comment very much on the changes. My main interest is if "Everything" can be used for 30+ employees to search through their shared network drive. I put up a quick test: letting "Everything" index a certain network folder with 400000 files (130GB). I left the computer for some hours, and did not notice how long the initial indexing took. But re-indexing took 25-40 seconds. So maybe I can assume that re-indexing our full network drive (1000GB) will take 3-5 minutes. Hmmm, any idea on how the system will behave with 30+ instances of "Everything"? Where is the bottleneck with indexing? Local CPU? Network traffic? Disk IO on the network drive server? If 3 people updates their "Everything" index, will the 27 other users notice when they access the shared drive? and of course you should set "WIN+F3" for the show window key. And how can "macros" be used after adding a bookmark? I tried to define some search terms like "ext:mp3;wav;flac" with macro "audio:", then I type "audio: kid song" and it does work as if I searched for "ext:mp3;wav;flac kid song" (which gave results). Last edited by kmc on Sun Jan 06, 2013 6:11 am, edited 2 times in total. I am looking into the required restart after installing everything.. I appears that everything does not have admin privileges even when run elevated. 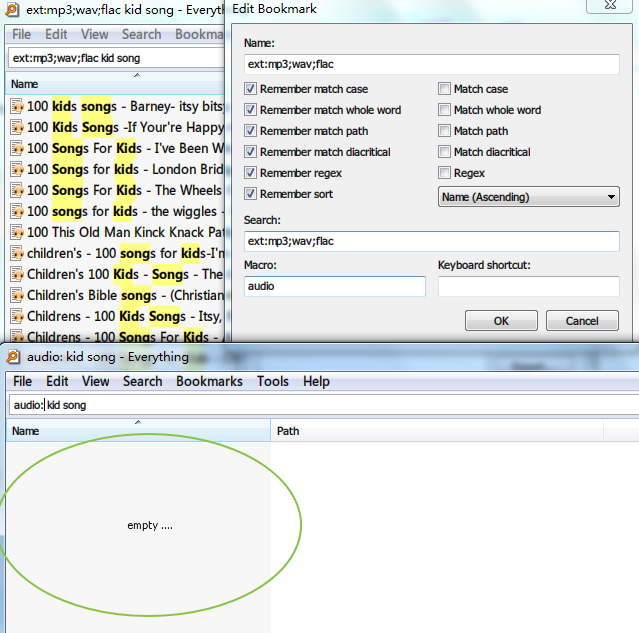 maybe allows specialized bookmarks like "%s ext:mp3;wav;flac" where %s is the existing search term in the input box. I think it would be better to bring back filters... I'll see what I can do.. The toggle key was replace with the show window key. This has similar behavior to the old toggle key, except the search window is not hidden when it is the foreground window. I could add an option to toggle the window instead of always showing it if desired..
Indexing one million files takes 5-10 minutes. Updating or "re-indexing" can be quick if the file system is cached, but usually you can expect updating to take the same amount of time as the initial indexing. Try having them all update at roughly the same time, the OS should cache the file system. From what I have seen it is mostly Disk IO and network traffic and a little CPU for NTFS volumes. If this concerns you, you might like to try creating a file list of server and having the clients open this file list. Please note file lists do not monitor changes. Please try omitting the trailing colon (:) from the bookmark macro. OK but then I searched for "audio kid song" and nothing appears, where as "ext:mp3;wav;flac kid song" gave results. But please make sure the macro in the bookmark does not include a trailing colon (:). "toggle windows key" is a very useful key. Plz make it back. I fell sad that the new version removed a lot of wonderfull function in 1.2.1.452. 1、Where is the history (Search History and Run History)? It can save a lot of time when i type filename? 2、And the Keyboard→Show commands containing，it is a wonderfull function to find a function, but now i can't find it in the new version. fankairong wrote: I fell sad that the new version removed a lot of wonderfull function in 1.2.1.452. I find the "add to bookmarks" feature really better than history, especially when you can assign a keyboard shortcut for these bookmark entries. But I wouldn't buy the reason for removing history due to privacy concern. Everything is too powerful a tool for your buddies to find out your wanna-hide videos, etc. A master password should be the first thing in mind to fight against this, IMHO. added Toggle window key option. the macros were being enclosed in diacritic: instead of the diacritics: modifier. How can handle the file everything.lng ? I mean i want cut useless language, and fix my home language translation. But it can't open in notepad directly. Sorry for my english, it not my home language. Happy to see a new release. Would it be possible to pin bookmarks to the Windows 7/8 Jumplist? That would be a killer feature. For the longest time, I have assigned Shift-Esc as my Toggle Window hotkey. Unfortunately, there is no easy way to do this now because as soon as you press Esc, the window closes. Can you please fix this? Of course, without now being able to auto-sort by Recent Changes and no HTTP server option , I primarily have to stick with the previous version (1.2.1.451a). I wonder if I can run both simultaneously... checking... SWEET, I CAN! Okay, apparently, I can have the best of both worlds. EVERYTHING. IS. AWESOME. I have now set my toggle for version 1.3.0.631b to Alt-Space, and version 1.2.1.451a to Shift-Esc, so I can use either one. So far, no conflicts! Thanks David! need the "history" back too!, privacy is not the reason to remove this function, putting it back and disable it as default will be a better option. Thank you for the updates - Everything rocks! Triggering a Bookmark Macro removes the previous search phrase. But I find it useful to toggle macros/filters with the search phrase intact. Here is my Autohotkey script for that. F12 toggles a folder filter on/off. F11 toggles a filetype filter on/off. It should be easy to modify for anyone familiar with autohotkey. Note: if you run Everything as administrator then run the script must also be run as administrator. It's very lamentably... I have done user filter of the trash and I use it every day. You can still do the same thing with bookmarks. I just happened to pass and was surprised a new version released, cool! The speed bump was great and the cleaner "option" was nice. But I think I'll keep my Version 1.2.1.452, these new versions are too "empty" -erm, "void" for having removing at least a dozen of time saving features/functions used everyday. First of all it is great to see you back. Without Everything and Type & Run (software to start things with aliases) I could not use my many TB disks anymore. Everything is great. But at the new version I did not find an easy way to switch between folders and files only in the search results. I am afraid I am not clever enough to do it. But how can I set this up again? those commands worked fine with old version, but do not work with new version, I hope you can fix this. If I search on a x64 machine explorer.exe I don't get the one one in Windows folder.Why? It is because Everything doesn't handle well links (soft,hard,etc)right? The newer version of "Everything" requires the full path name to the executable. instigator wrote: If I search on a x64 machine explorer.exe I don't get the one one in Windows folder. "Everything" does not index hard links due to a limitation with NTFS Journal logging. If you really need hard links try the new folder indexing and add the c:\Windows folder. Please note you might end up with a few duplicated files, but all the hard links should be there. One last question: it's Everything faster now than the v1.21? Also please bring filters back. "Everything" version 1.3.0.632b is now available. Would it be possible to pin bookmarks to the Windows 7/8 Jumplist? That would be a killer feature. Yes, With "Everything" version 1.3.0.632b you can make a shortcut to "Everything" with the -bookmark <name> command line option and pin that to the taskbar. Fixed in "Everything" version 1.3.0.632b. You can now search for commands in the keyboard options page with "Everything" version 1.3.0.632b. I am reviewing the option to re-add recent changes, search history and run history / open source "Everything". It will take a LONG time to re-implement some of these features so please be patient..
ETP/HTTP might be back as a plugin.. if I find time. Added custom filters back in "Everything" version 1.3.0.632b. The custom folder filter is the same as before. Is Everything faster now than the v1.21? Much, much faster, "Everything" 1.3.0 now supports multi-core searching and sorting. Even on single core CPUs "Everything" is faster. void wrote: You can now search for commands with "Everything" version 1.3.0.632b. But please consider bringing back some kind of "filter" again. Thanks David, your solution did work. Congratulations, Everything is much much better and faster now, very happy with it. I see you have included environment variables support, a thing I asked long time ago. I will donate again, and I hope all the people who uses this terrific software does, becasue Everything does deserve it. Thanks so much. export function in the filter manager has something wrong with unicode character(expecially Chinese character ) . hope to fully support unicode !!!! "Everything" exports filters with UTF8 encoding. Please open the filters.csv file with Notepad as UTF-8 and resave the file as UTF-8. This will prefix the UTF-8 BOM header to the filters.csv file and will allow you to open this file with Excel with the correct encoding. I just wanted to say, THANKS, thanks for coming back. Even if you see a lot of critics don't take them too deep. We better have a few really supported features than nothing... Everything is the fastest thing I've ever used, and even if only was that it would be enough. David, could it be possible to add again "Copy Path to Clipboard", now there is just "Copy Full name to Clipboard". Not a big deal, but it saves a little time. You might also add the option to add or disable the final "\" character of a path. Regards. Hi, sorry for bother again, but I want to know if exclude filters can use regular expressions. I want to exclude for being indexed all files and folder who start with a dot. How can I do that? Last edited by instigator on Fri Jan 11, 2013 10:12 pm, edited 1 time in total. Hi, I installed "Everything version 1.3.0.629b" in my windows 8. But "start everything on system startup" is not working. I tried many ways but after windows 8 start Everything 1.3.0.629b not start automatically. I faced same problem in earlier version of Everything. But when I manually start the program there is no problem. It works fine. I love this program. This is one of the best program I ever seen. Thanks improving this program. gussan wrote: David, could it be possible to add again "Copy Path to Clipboard", now there is just "Copy Full name to Clipboard". Not a big deal, but it saves a little time. You might also add the option to add or disable the final "\" character of a path. Added to my "things to do" list. 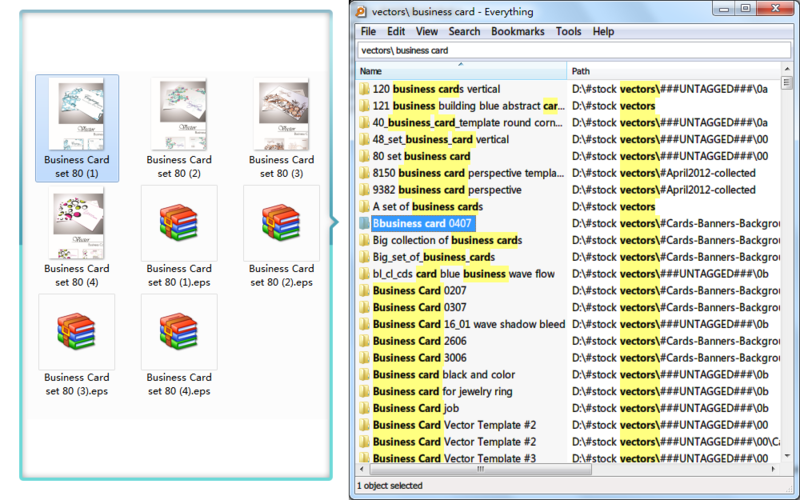 If you are pasting folders into "Everything" a lot, try copying the folder normally (Ctrl + C) and paste that into the search edit with Ctrl + V.
No, you can only exclude folders with wildcards. prome1990 wrote: Hi, I installed "Everything version 1.3.0.629b" in my windows 8. But "start everything on system startup" is not working. I tried many ways but after windows 8 start Everything 1.3.0.629b not start automatically. I faced same problem in earlier version of Everything. Seems to be working fine here on Windows 8 at startup, with or without administrator privileges. Could you have something installed that might be blocking "Everything" from starting up at startup? Does task manager show an "Everything" process? Thanks for your answer, working fine. One thing I think is useful is to copy the "full name " or "path" of many files at once. For example if I want to replace sqlite3.dll to many folders with and updated version, I could copy all paths that have this file, and put them in a .bat file. Regards.